Entertainment Weekly reports that HBO has revealed a new poster image to Game of Thrones Season 8. You can check out the new image that indicates the Iron Throne's design with a dragon head underneath. 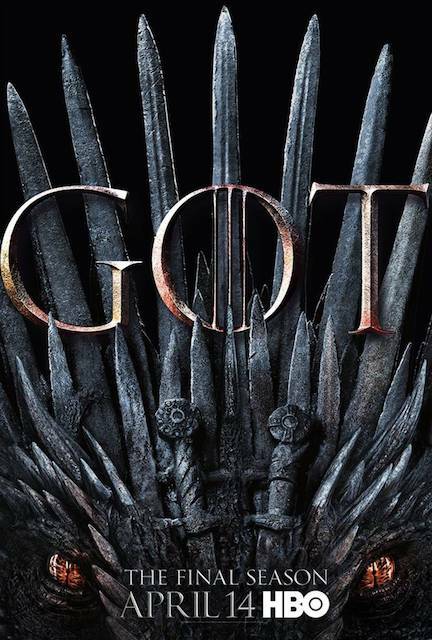 Per EW, the new Season 8 poster image will be used for outdoor advertising and print ad campaigns, along with any home video (DVD, Blu-ray) cover release. At the end of last season, Daenery's (Emilia Clarke) dragons and her huge army were finally on their way to Westeros, where Cersei (Lena Headey) has now become queen after her children's death. Night King's (Vladimir Furdik in Season 6) army goes south, and a fight seems to be imminent.